Much of the talk (in England at least) ahead of Bangalore Royal Challengers against Chennai Super Kings was of Pietersen vs Flintoff, but it was Muralitharan and Hayden who made the biggest contributions as Chennai rolled over Pietersen’s side, claiming victory by 92 runs. To be fair to Flintoff, he did hit 22 from 13 balls and took 3-11 from 4 overs (including the wicket of Pietersen) to leave Bangalore reeling, finally slumping to 87 all out in pursuit of Chennai’s 179. 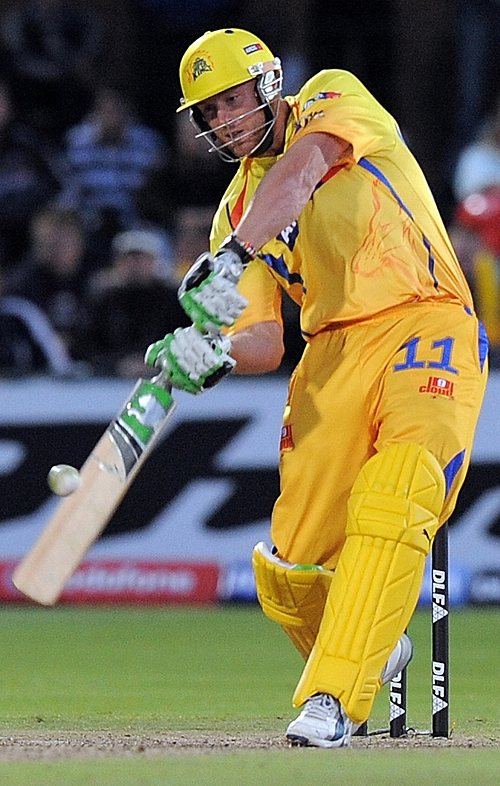 65 of those 179 runs were scored by Matthew Hayden off just 35 balls as the Super Kings ran riot. The second season of the IPL is starting to heat up now, and if the marquee names like Hayden, Muralitharan and Flintoff continue to deliver, then the competition is sure to monopolise cricket coverage for the next few weeks. Muttiah Muralitharan has finally surpassed Wasim Akram as the top wicket-taker in ODI history. The record-breaking wicket is shown in the below video. Have India figured out Mendis? The first time India faced the twin threat of Muralitharan and Mendis, in the Asia Cup final of July 2008, the Sri Lankans ripped through the Indian batting order. In the subsequent Test series, the ‘spin twins’ continued to cause all kinds of problems. By the time of August’s One Day series, however, there were signs that India’s batsmen were learning to cope. There has been, as there tends to be, much talk of Mendis and Muralitharan in the build-up to the current series, but the message coming from India, regarding the youngster in particular, is that Mendis is not a threat, and that key batsmen will look to attack him. This is in marked contrast to Pakistan’s more wary approach, which included special training designed to prepare batsmen for the particular challenges that Sri Lanka’s twin spin attack poses. In today’s First ODI, the two spinners’ combined figures were 20-0-99-1, which may suggest that India are starting to find a successful strategy. It remains to be seen if the next four ODIs produce any further evidence that bears out India’s confidence. India go into the ODI series against Sri Lanka riding a run of good form – the tourists beat their hosts 3-2 last year without Sehwag or Tendulkar, and have since pummelled England 5-0 at home. Aside from tournaments such as the Kitply Cup and Asia Cup, their last series defeat was way back in 2007, and their professed desire to be the best in the world is constantly gaining credibility, especially now that the pace attack is so strong. That pace attack is likely to comprise Zaheer Khan, Ishant Sharma, Munaf Patel and one other, given the fact that chief spinner Harbhajan is injured. The batting line-up looks as strong as ever, even if Tendulkar isn’t the archetypical modern ODI opener. For Sri Lanka, much will depend on whether Muralitharan and Mendis can improve on the less-than-exemplary performances they put in the last time these two sides met in an ODI series (which of course followed a Test series where they had made mincemeat of India’s batsmen). The former is poised on the verge of a world record, which should be motivation enough. If those two take wickets and Nuwan Kulasekara continues his recent good form, India will have their work cut out for them. Nevertheless, India will be favourites, given their form and the sheer quality of their side.